Kids paintings do not only have to be made with their hands. With air painting children get to use their mouths instead. I found that children enjoy using straws for different activities. I believe that kids are fascinated by manipulating things, moving them, and just plain old shaking things up just by blowing air. Air is magical; from making bubbles in a cup of chocolate milk to blowing up a balloon or seeing a windmill blow in the wind. With air painting, children get to simply blow air on the paint and see how it begins to spread on the paper. As a follow up, you can ask the children what do they see in the paint. An image of a cat? Or maybe a bird? Cognitive development and creativity. When this activity is done in groups or with a partner it helps develop social skills as well. Paint is usually too thick, so I recommend diluting it with some water. Drop the paint on the paper and then blow on it with the straw to create a design. Ever tried to use ice for a paint activity? It does get cold, I must warn you, but children love to try and keep that slippery ice in their little hands. By doing this activity in the winter time, you can take a moment to talk to your child about hot and cold, the changing seasons, and encourage them to actively think about thier surroundings. This is another great activity to share with a friend. 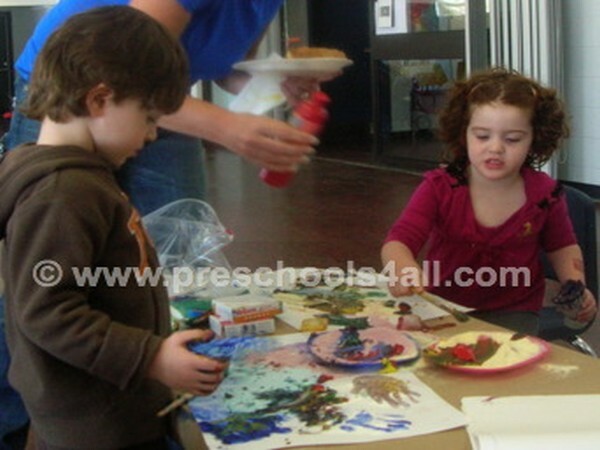 Sharing the experience of painting creates a deeper bond between children. Develop fine motor skills, communication skills, social development. Let your child dip the ice cube in the Jell-O powder. Paint with the ice cube on the paper.